The latest version of the much-loved browser is the first official release powered by Blink, the new rendering engine the Chromium project develops for Google’s Chrome browser after forking from WebKit in April. Opera said in April it would switch to Blink after previously announcing it was giving up its own engine, Presto, for WebKit. Opera’s new Discover feature shows you news articles based on location and interest. Opera 15 offers a number of enhancements that first appeared on the mobile version of Opera as well as come classic features. Turbo has been renamed Off-Road mode similar to Opera for Mobile. This feature compresses Web page sizes through Opera’s servers before hitting your browser, allowing for faster Web page delivery and a more manageable browsing experience if you’re on a slow connection. Discover, another mobile crossover, shows you a stream of news articles based on location and interest categories such as travel, arts, business, sports, and technology. Stash creates a visual and searchable set of bookmarks. 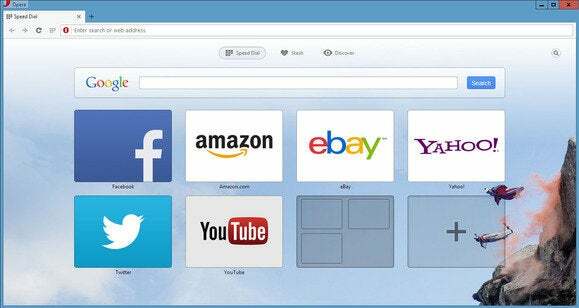 Opera 15 also sports a new take on bookmarking called Stash. Whenever you hit the heart icon in the upper right side of the address bar, the page you’re viewing is saved in the Stash, which is accessible from Opera’s start page. Stashed pages are displayed as Web page thumbnails, the size of which can be adjusted using a slider to the right. Stash also has a search function that lets you search for pages by keyword—a handy feature when your stash collection gets to be a little big. Although Opera 15 now shares some underpinnings with Chrome and Chromium, Opera still maintains its own distinctive look and feel. Power users will find that Opera still offers mouse gestures for navigation in this new version, though restore and minimize didn’t work in my tests. Also, link gestures were not working properly while trying out Opera 15 on Windows 8. M2, Opera’s built-in email client is now a separate download, as previously announced.